The barred owl is native to North America, and is known for its distinctive hoots, which are often mistaken for human sounds by people. This species of owl has almost 8 different hooting calls. 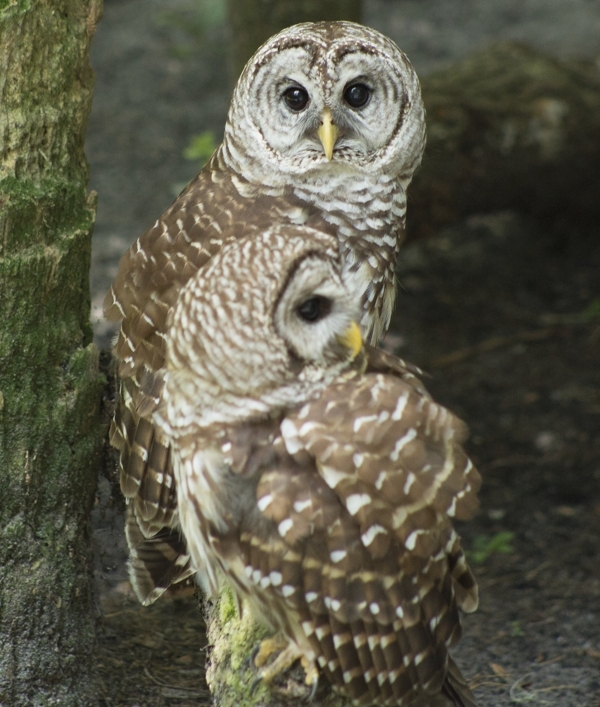 The hoots of a barred owl almost sound like "Who cooks for you? Who cooks for you all?" Strix varia or the barred owl often resides in tree cavities or in the abandoned nests of other birds. This nocturnal bird is also extremely territorial, often showing aggression towards intruders and defending its territory by hooting from various positions along the perimeter of the area. It is usually seen perched high up on a tree under the cover of dense foliage. Not only is it a non-migratory bird, but it also lives quite a sedentary life. In its lifetime, it may move a maximum of 6 miles from its original location. The major motivation for such a move would be poor food availability. They occasionally engage in fishing, and their consumption of crayfish often causes the feathers on their belly to turn a shade of pink color. 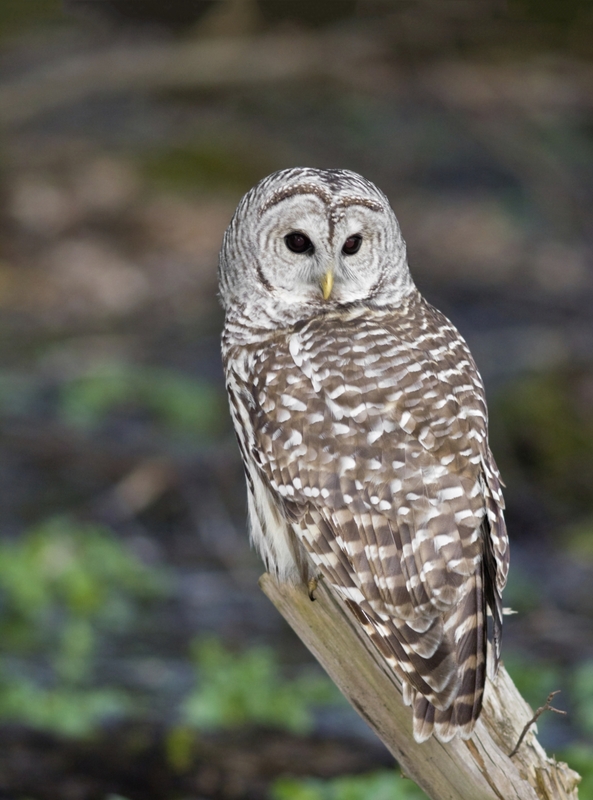 Apart from this, the barred owls are well-known on account of their distinct hoots and calls. They display 8 distinct types of hooting. Due to this, these owls are also known as the hoot owl, the eight-hooter, and Le Chat-huant du Nord in French, which translates to "the hooting cat of the north". Its other names include the swamp owl, striped owl, wood owl, and the rain owl. 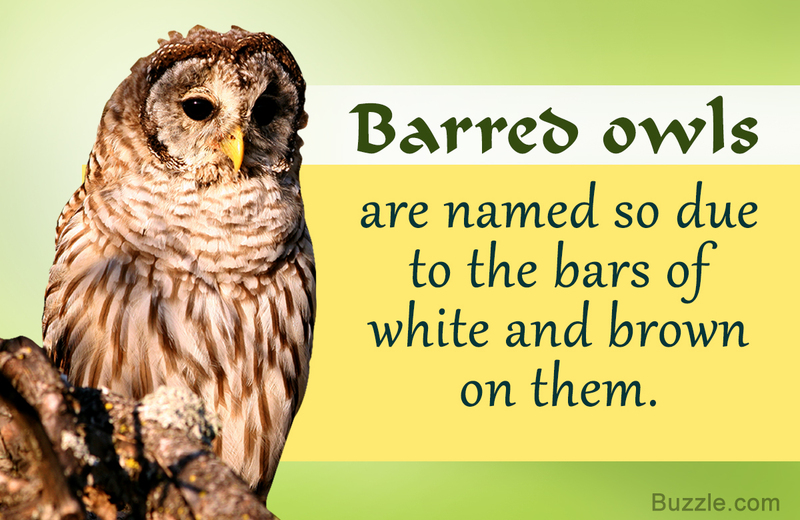 ◈ The barred owl gets its name from the distinct bars of white and brown colors on its body. 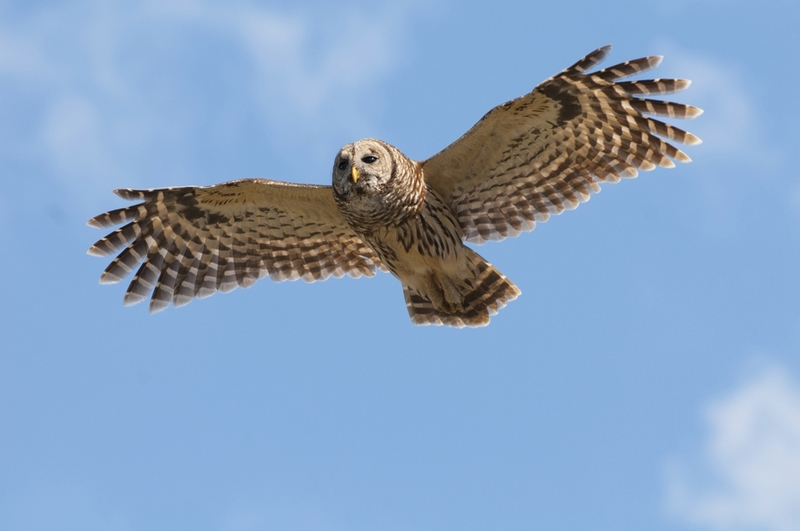 It has brown eyes, as compared to the yellow eyes of other species of owls. It has dark rings around its eyes, and a hooked, yellow beak. The body is heavily covered in brown and white feathers that extend up to the sharp, yellow talons. The head of this owl is rounded and shows an absence of ear tufts. The neck region shows presence of horizontal bars, while the body has vertical bars. It is often mistaken as the spotted owl, which looks similar to this species, but with the distinction of having spots of brown color instead of bars. ◈ An adult barred owl may reach a height of about 25 in, with a wingspan ranging from 40 to 50 in, and weighs around 1 - 3 lb. The females of this species are seen to be larger and heavier than the males. ◈ Barred owls are widespread across North America. They prefer habitat locations in old deciduous and coniferous forests that have a proximity to swamps or marshes. They nest in empty tree cavities or in the abandoned nests of other birds. Their nests are usually lined with a layer of soft feathers. Neither do they migrate, and nor do they venture beyond their territory, unless there is scarcity of food. ◈ More and more barred owls are being seen near urban settlements recently. This may be due to the easy availability of food source in the form of household pests such as rodents. ◈ While rodents are their main prey of choice, they also feed on rabbits, opossums, bats, smaller birds (including owls), frogs, salamanders, lizards, insects, snakes, etc. Occasionally, they also engage in fishing, and feed on fish and crayfish. ◈ They hunt by swooping down from a high perch, and grabbing the prey in their talons. They ingest the whole animal, which is then digested by the stomach acid. The undigested parts are regurgitated in the form of a pellet. ◈ Barred owls initiate mating in winter. The mating process is initiated by the males producing courtship calls and the females making contact calls. The males try to impress the females by preening and flapping their wings. They also procure food for the females. Once a female complies, a female-male pair bond is formed and they mate. These owls bond for life. The mating eventually leads to the female laying 2-4 whitish eggs that are spherical, and have a rough exterior texture. These eggs are incubated by the mother's body, and take almost 30-35 days to hatch. While the mother is engaged, the male goes and retrieves food for the female. ◈ Once the eggs hatch, the juveniles are cared for by the parents for a period of 4-6 months, during which they crawl and learn to fly. Juveniles possess the ability to climb trees. They do so by grabbing on to the bark of the tree with their beak and talons, while flapping their wings. Once a juvenile loses its down, there is hardly any difference between its appearance and that of an adult. The juveniles start flying at six weeks, and are capable of reproducing when they are 2 years old. These owls live to an age of 13 years in the wild and may live up to 23 years in captivity. These species can be differentiated based on their coloring and extent of feathering. ◈ The great horned owl is a major predator of this species. ◈ The oldest barred owl was 24 years old. ◈ They mate for life and form monogamous pair bonds. ◈ They compete with the spotted owl species for food, and hence are endangering them. ◈ Their mating with the spotted owls produces an offspring called sparred owl. ◈ Arabic culture regards owls as being evil, while according to western culture, owls signify wisdom. ◈ They are listed as a Least Concern (LC) species by the IUCN.